BRISTOL - An Indiana Street home sustained minor damage on Friday when some bedding caught fire and filled the home with smoke. Firefighters responded to 2:05 p.m. to 15 Indiana St., a single-family home, on the report of smoke inside the structure. Dep. Fire Chief John Ziogas said the homeowner found a small fire in one of the bedrooms after seeing the smoke. He tried to put it out himself, but he was driven out of the house by the increasing amount of smoke, Ziogas said. 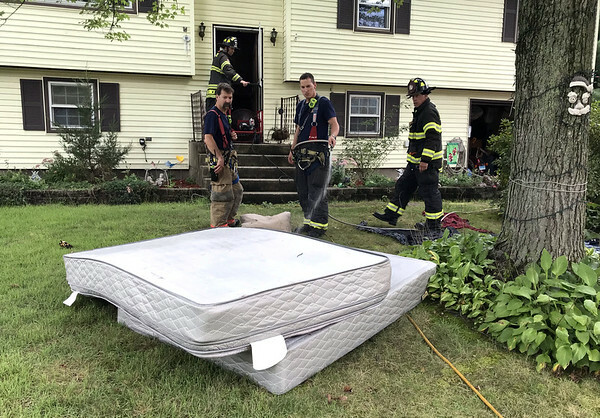 Firefighters removed a mattress and a box spring from the home and gave them a good soaking on the front lawn. The wall where the bed was sustained some charring. Ziogas said the small fire was likely caused by some bedding that was left on the baseboard heating. Firefighters had to tear through the sheetrock where the wall was burned and rip some insulation out to make sure nothing within the wall could start a bigger fire. Aside from the charred wall, Ziogas said the home sustained minimal smoke damage, which would likely only result in some clothing and belongings smelling like smoke. Posted in The Bristol Press, Bristol on Friday, 14 September 2018 15:27. Updated: Friday, 14 September 2018 15:30.